Let's walk through this illustration, beginning at the green line on the left side, and discuss what can happen when an elderly person faces an illness. 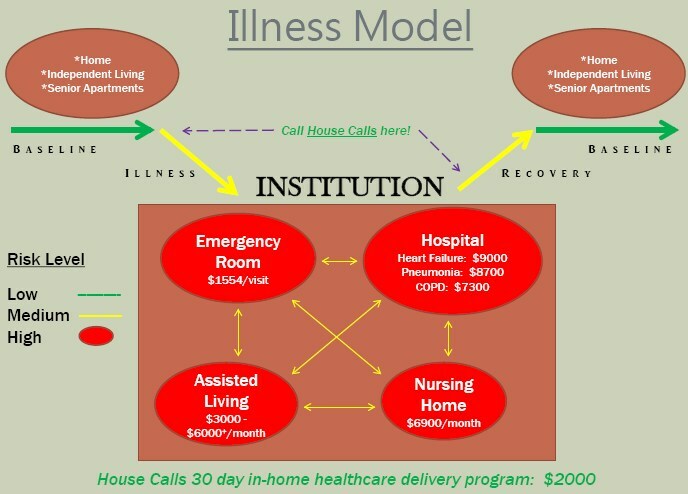 The green baseline that's shown is meant to indicate a low risk level where most elderly people function very independently at home, and this can be in a house, an Independent Living Center, or in a Senior apartment. They have a stable baseline medical status and adequate support with family and friends, and they tolerate the little ups and downs of daily living just fine. But the greatest fear of many elderly people is what happens if they get sick. This is a time when they feel very vulnerable. Besides being sick, they're scared that they may lose their independence or even lose their home, and they also worry about how much it will all cost. So when an illness sets in, and their health begins declining as shown with the yellow line on the left, their risk level goes from low risk to medium risk, and this is when elderly people feel scared. They're afraid that if their illness continues, they may need to go to the emergency room or even be hospitalized. If this happens, their overall risk level now becomes high. And then if they're too weak to recover from their illness back home, or don't have enough support at home to meet all their needs, they may not be able to go back home, and instead have to leave their home and move into a much higher cost facility. But if they haven't been too weakened by their illness, and if they have good support and lots of help at home, they may be discharged from the hospital and continue their recovery in the comfort of their own home. In the illustration, they leave the red, high risk areas and begin climbing the yellow recovery line on the right side of the diagram where their risk level is now about medium. With continued in-home support, the goal is to reach the stable baseline health they had before their illness and get back to being low risk again.